In a swift move seen to quell doubts over its latest smartphone quality, Samsung Electronics confirmed Friday that it will be upgrading the Galaxy S8 software criticized by some for having red-tinted screens. The latest measure came after Samsung’s new flagship smartphone Galaxy S8 faced complaints that the display panels have a reddish tint. 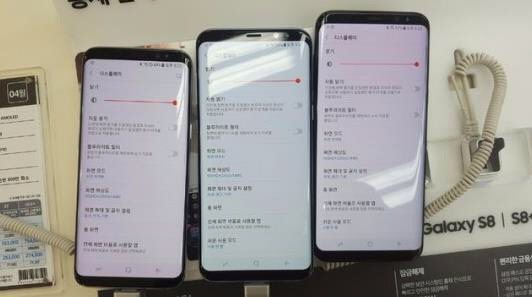 Some customers who preordered the Galaxy S8 have written via online communities that their new phones have a reddish screen that did not improve even after adjusting the red color to the lowest setting. The upgrade next week is to expand the color range so that users can make the red color even lower. Industry watchers said although Samsung may shun it as a non-issue, the red tint may come from a software glitch. “If clients feel uncomfortable about their phones, they are usually right. It seems there was a problem in the software in setting the color balance,” said a professor at Seoul National University, who declined to be named. “Still, the problem is expected to be solved with the software upgrade since the problem does not appear to come from hardware,” he added. On Friday, Galaxy S8 and Galaxy S8 Plus were officially launched in Korea, the US and Canada, 20 days after they were unveiled in New York on Mar. 30. They will go on sale in 50 nations including Europe, Singapore and Hong Kong a week later. They will also be available in 120 nations including the world’s largest smartphone market, China in May. In Korea, preorder of Galaxy S8 during Apr. 7 to 17 reached around 1 million units, more than five-fold jump from the preorder of its predecessor Galaxy S7. “The red-tinted display issue does not seem to significantly affect sales of Galaxy S8. The sales of the new handset is expected to reach 500 million units this year to outnumber the figure of Galaxy S7,” said Noh Geun-chang, an analyst at HMC Investment Securities.